To Celebrate the Lady who sacrificed all, Squirrelly Productions presents the Games of Tailtiu. Our Games Master has arranged some competitive events to crown a children's, a male and a female champion. Unlike the ancients, we live in a litigious society so a waiver is required - our lawyers insist! There will be individual trophies and a team competition. You will be organized into teams (Formorians, Tuatha, Fir Bolg and Avalonians) of at least five: two males and two females must be on each team. Children will have individual competitions only. In each event, the team receives the highest female and the highest male score. The Dagda was High King of the Tuatha Dé Danann after Nuada was injured in battle. His primary weapon was a hammer or club. Thus he was known as “the good striker”. We honor Dagda with a hammer toss. You will throw a two pound hammer underhand for distance. Children will throw a plastic hammer. Distance from release to first landing determines standings. 3 tosses allowed per contestant, best toss counted. Contestants go in order, but may defer to throw later than their turn. In case of tie, person with fewest tosses wins. Don't worry, we're not using a regulation caber. Our caber is much shorter and much lighter! The ancients used to throw a log across a stream so that warriors could cross. 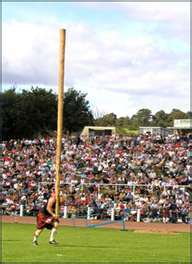 Thus, the object of the caber toss is not the distance of the throw, but rather to have the caber fall directly away from the thrower after landing. A perfect throw ends with the 'top' end nearest to the thrower and the 'bottom' end pointing exactly away. If the throw is not perfect, it is scored by viewing the caber as though it were the hour hand on a clock. A perfect toss is 12:00. A caber pointing to 11:00 would yield a better score than one pointing to 10:30 and 1:00 is the same score as 11:00. 3 tosses allowed per contestant. Contestants go in order, but may defer to throw later than their turn. In case of tie, person with fewest tosses wins. Yes, we even have a kids caber! Balor could kill you with his Evil Eye just by looking at you. Contestants must put a beanbag through his eye. Those surviving the first round must do it again at a greater distance until only one contestant survives! Lugh carried a black shield and a five-pointed throwing spear. Contestants will toss Lugh’s spear for distance and accuracy. Spear must hit target at 15 feet. Contestants that cannot hit at 15 are eliminated. Then at 20 feet, etc. until champion found. 2 tosses allowed per contestant at each distance. Contestants go in order, but may defer to throw later than their turn. In case of tie (i.e. at a certain distance, no one can hit the target), fewest total tosses wins. Men and Women only. They say that the Scots invented Golf and what are the Scots if not Celts? Ladder golf is kind of a cross between golf and -well we're not exactly sure. But it does seem like an appropriate game for our Festival. 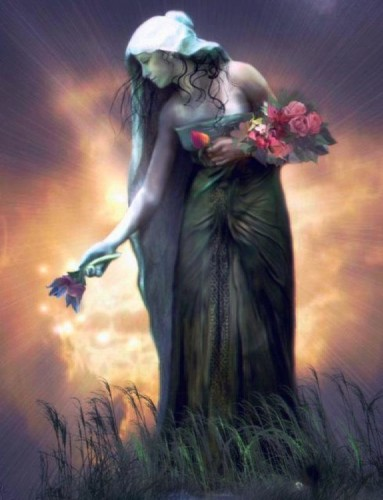 Ogma SEZ: Ogma was Lugh’s half-brother, and during the battle with the Fomorians, his champion. He is a god of eloquence and is often pictured with long chains through his smiling mouth that pierce his tongue and are attached to the ears of a group of men that willingly and happily follow him. This is like Simon sez. You do what Ogma says. If you don’t do it, or Ogma doesn’t say to do it and you do it, then you are eliminated. Last one to be eliminated is the winner! Tailtiu, may I? Same rules as Mother May I? but ask a question that Tailtiu will find pleasing, or she will make you step backward. Remember Tailtiu is a great queen, Lady of the Harvest, and a symbol of abundance and of the earth! So ask to do something she will like! A male. a female and a kids champion will be crowned! Lugh was a multi-talented guy. Not only was he fierce in battle, but he could recite poetry with the best of Bards. The ability of the bard to remember and recite poetry, and the ability of the audience to listen to, understand, and remember that poetry was critical in pre-literate societies. In the evening, while the kids are watching a movie, there will be a poetry recital. Yes, you can be somewhat bawdy. (Lute optional.) There may even be spontaneous dancing!